No Abraham Is Convincing Enough To Save Any Sodom And Gomorrah! The story of Sodom and Gomorrah is perhaps the best known of the “clobber passages” . This story is told in one of the oldest books in the Bible, and has been a favorite among artists and writers for centuries. Even if you have never read the Old Testament account of the destruction of Sodom and Gomorrah, you have probably seen it portrayed in a movie or book. Since the biblical account is very long,you can find the original in Genesis 19 and the preceding chapters. The generation of today is so fortunate that, due to one or two reasons, the Sodom and Gomorrah which they might have heard of as cities mentioned in the Book of Genesis and throughout the Hebrew Bible, the New Testament and in deuterocanonical sources, as well as in the Qur’an and hadith, is right here in Ghana and no other place than its capital city Accra. The ‘twin city’,Sodom and Gomorrah as it stands now was occupied mostly by migrants from all parts of the country who had come to seek for their basic needs in the country’s capital. 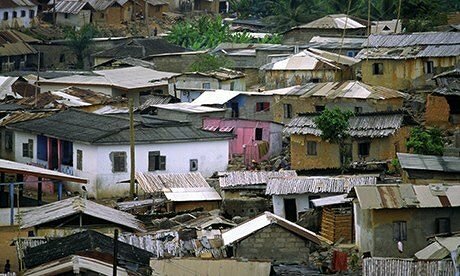 It is one of the popular slums known in Ghana. One can not talk about this ‘twin cities’ without mentioning the filth in which it is engulfed. Inhabitants of this ‘twin city’ are prone to diseases like cholera and some natural occurrences like flood. 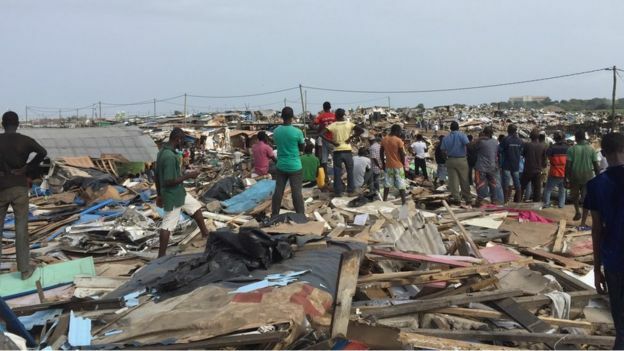 In response to the almost unprecedented June 3 disaster in this country,which almost every Ghanaian is still mourning about ,it was prudent of the authorities of the Accra Metropolitan Assembly to pull down some structures and settlements which were on water ways and posed threats to more flood cases in the capital city. June 22 was the day Sodom and Gomorrah had it share of what i call ‘AMA cake’.Structures that bore the scares,memories and secrets of its inhabitants were pulled down without mercy. This has led to the displacement of over hundreds of people. It was no surprise at all that the victims of the demolition exercise took to the streets to demonstrate against the government and the authorities of AMA. Here lies the subject of controversy;”Can we afford to sit back for another flood to wipe out all the people of Accra before the city authorities act?” Hell no! Not at all! As far as i support the story of the destruction of Sodom and Gomorrah in the bible by God,i also wholeheartedly support this destruction of Sodom and Gomorrah in our generation by Oko Vanderpauye. Exercises like this nature although seem unfair and harsh are the best ways we could put the wrong to right. This is not the time to tag positive actions like this as politically inclined as i saw some of the angry demonstrators do. You and I know the AMA failed to execute their duties some years back. And that has given birth to these slums we see around. They should have set the records straight and put measures in place before these settlements became large and stocked with many inhabitants. But the elders say,”sankofa y3nkyi”.This is why we have to accept this ‘harsh’ exercise as a blessing and the way forward to a better Accra for us all. The government also on their part has failed the people of Sodom and Gomorrah. They have failed to provide the basic needs for most people of this country. Why won’t people descend down here to make slums,the little they can afford, just to make a living? What saddens my heart is that,we have been able to accept war victims from other countries here. We have taken it upon ourselves to provide for them;shelter,food,water,school,health care and others but we as a nation see no need in providing same for our own citizens! Our own people! Our own blood! This is how far we have failed the people who lived in the slums. I am not saying those people in the slum were jobless and poor and couldn’t fend for themselves. But i think the people deserved better than the Sodom and Gomorrah in which they lived. After all, refugees in Ghana don’t live in a ‘Sodom and Gomorrah’. On the contrary,we can not afford to watch the city rot. The fact that the government has failed us doesn’t mean we should slowly do things that would kill us all. It doesn’t mean we should create slums on water ways,we should create filth to choke our gutters,live in filth,and what have you. The worst has already happened,many have been rendered homeless,properties have been lost but we can say it is never too late. How can we appease the then people of Sodom and Gomorrah? The government, AMA and all other cooperate bodies should come on board to support the displaced victims. At least, according to the bible,when God spared Lot and his family from the destruction of Sodom and Gomorrah,he directed them to a new place where they could start life all over again. So ‘God’ of Accra,Oko Vanderpauye, kindly help your ‘Lot and his family’, the displaced people because there is a saying that “half a loaf is better than none”. Let us all remember that as Abraham tried hard to convince God to spare Sodom and Gomorrah but the inhabitants’ actions and way of life well spoke that they truly deserved the destruction that was the same way Human rights activists and other people also tried to convince the ‘God’ of Accra, Oko Vanderpauye but to no avail because the nature of the slum well spoke that it truly deserved the demolition. This should be a good lesson as well as a warning to other slum dwellers in the capital city. Because, no Abraham is convincing enough to save any Sodom and Gomorrah! They call me Boateng Boakye Evans and i see a new and a better Accra safe from slums,floods and filth only because the harsh but right measures were put in place by the city authorities. Previous Post HOW I WISH THERE IS ANOTHER YESTERDAY!